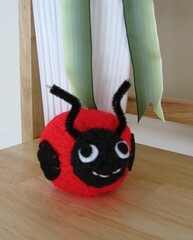 I saw this ladybug pattern on Ravelry and knew I had to give it a try. It was a really quick and easy project and it turned out too cute. I had to improvise a little, since I didn’t have all of the items. So, I used pipe cleaners instead of wire and felt eyes instead of google eyes. I like the ladybug pattern, please.